The Centers for Disease Control and Prevention (CDC) confirmed that the rare “brain-eating” parasite, Naegleria fowleri, killed four-year-old Drake Smith, Jr. this summer in St. Bernard Parish, near New Orleans. The boy is thought to have inhaled Naegleria-contaminated water while playing on a backyard water slide. The Louisiana Department of Health & Hospitals confirmed the parasite’s presence at the residence and in four locations in the water system, along with chlorine levels under the recommended level of 0.5 parts per million. 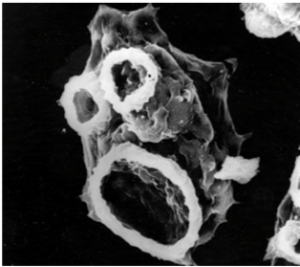 It is the first time Naegleria has been identified in US drinking water. Chlorine levels in St. Bernard Parish are being raised to help control the parasite. According to a Times-Picayune article, levels will be raised to 1 part per million for 60 days and then maintained at 0.5 parts per million thereafter. Reports of increased bottled water sales in the parish indicate that consumers might not realize that stomach acid kills Naegleria in swallowed water. The real risk of infection arises when contaminated water is taken in through the nose and the parasite travels through the nose into the brain. According to the CDC, Naegleria can cause a brain infection called primary amebic meningoencephalitis (PAM), which is almost always fatal. In 2011, a 28-year-old St. Bernard Parish man died after using tap water in a neti pot to irrigate his sinuses (The Times-Picayune article). With only 31 infections in the US in the decade 2002-2012, CDC notes the risk of Naegleria infection is very low. Nevertheless, concerned consumers may wish to take steps to avoid infection. SWIMMING IN FRESH WATER LAKES, RIVERS AND HOT SPRINGSWhen swimming in freshwater lakes and rivers, particularly in the South, nose clips should be worn to prevent inhaling infected water. Caution should be exercised around hot springs. The CDC recommends avoiding water-related activities in warm freshwater during periods of high water temperature and low water levels. It is best not to dig in or stir up sediment while taking part in water-related activities in shallow, warm, freshwater areas. SWIMMING POOLSSwimming pools must be adequately disinfected to destroy Naegleria and other waterborne pathogens. The CDC and the Water Quality & Health Council recommend swimmers use pool test kits to check pH and free chlorine levels of swimming pools before swimming. If readings are out of the appropriate range (pH between 7.2 and 7.8; free chlorine level between 1 and 3 parts per million), a pool manager should be notified. If pool chemistry is not properly maintained, the local public health department should be contacted. KIDDIE POOLSPlastic kiddie pools should be kept clean and dry when not in use and children should not play unsupervised with hoses. NETI POTSWhen using a neti pot to irrigate sinuses, follow directions for preparing saline water solutions. A December 6, 2011 press release issued by the Louisiana Department of Health and a CDC online resource urge neti pot users to use distilled, sterile or previously boiled water (least expensive option) to make up the irrigation solution. Clean and disinfect neti pots after use. After washing with soap and water, rinse with a solution of 1/2 tablespoon of chlorine bleach added to ½ gallon of water and allow to air dry. Can We Prevent the Next Naegleria Infection from Municipal Water? There is some speculation that there may be a connection between this summer’s Naegleria incident in St. Bernard Parish and Hurricane Katrina. The population of the parish fell dramatically after the 2005 hurricane, with a concurrent drop in municipal water demand. As a result, treated water resides in pipes for comparatively longer periods than it did pre-2005 under conditions that could promote the parasite’s growth, perhaps in slimy films on pipe interiors. But our monitoring data and understanding of Naegleria’s occurrence are poor. As a first step, we need a better focus on science to understand the ecology of this parasite. Second, many water systems—including the St. Bernard system—add chloramine to water to protect it as it journeys from the treatment plant to the consumer. Whereas chlorine is known to kill Naegleria, we need research to help us optimize chloraminedisinfection to help ensure proper municipal disinfection. We have the tools to take these steps. Is there a will to do so? Joan B. Rose, PhD, is the Homer Nowlin Chair in Water Research at Michigan State University and a member of the Water Quality and Health Council.